Mish's Global Economic Trend Analysis: What's the #1 Predictor of Success in Love? What's the #1 Predictor of Success in Love? Here's an interesting article that just came my way from the Washington Post. It's about success in love. Please consider The One Number that’s Eerily Good at Predicting Success in Love. When people are looking for a significant other, they often try to find someone whose values, education, earnings, hobbies and even height match their own. But new research suggests there's one promising measure for finding a committed partner that most daters overlook -- credit scores. A new working paper from the Federal Reserve Board that looks at what role credit scores play in committed relationships suggests that daters might want to start using the metric as well. 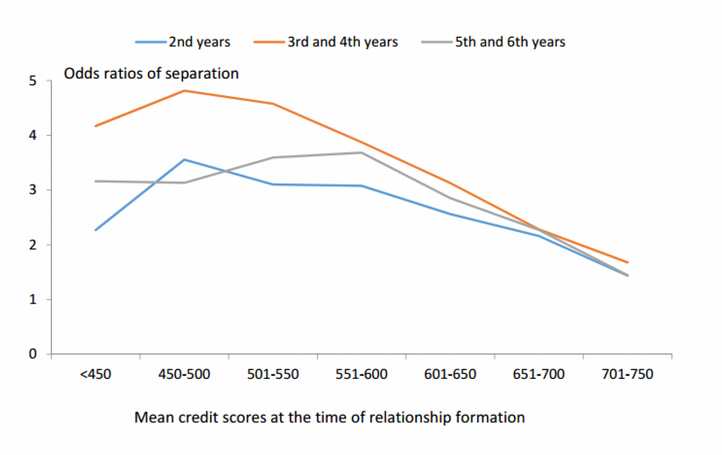 The researchers also found that having higher credit scores when they started the relationship meant that couples were less likely to separate over the next few years, as the chart below shows. In fact, for every extra 100 points in the couple's average credit score when beginning the relationship, their odds of splitting in the second year fell by around 30 percent. Couples in general are more likely than two randomly selected people to have similar credit scores. Over time, the credit scores of couples actually tend to converge, the study found, from about 55 points to about 22 points over the first four years of the relationship. 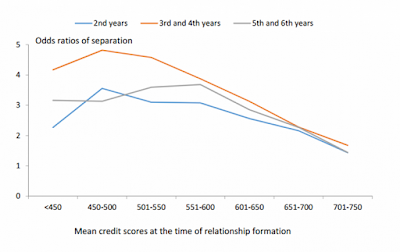 But if the gap between the individual credit scores was wider at the beginning of their relationship, the couple was more likely to break up as time went on, the researchers found. "What's your sign?" is so 60ish passé. Today, you need to ask "What's your credit score?" in some sort of polite manner, of course. You could also get right to the nitty-gritty and pay for a credit search. In the "trust but verify" category I offer this tip on what not to say: "Sweetie, what's your social security number? I need it to do a credit check on you."